On 31 December 2011, a whale mother and male calf were found dead on Opape Beach in the Bay of Plenty at the north end New Zealand's North Island. The seagulls had already pecked their eyes out by the time the park rangers arrived. Although clearly in the beaked whale family—the most mysterious marine mammal family—scientists thought the pair were relatively well-known Gray's beaked whales. That is until DNA findings told a shocking story: the mother and calf were actually spade-toothed beaked whales (Mesoplodon traversii), a species no one had ever seen before. 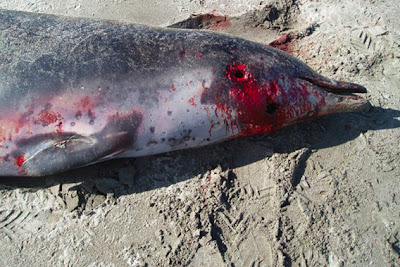 Scientists have known of the spade-toothed beaked whale for over 140 years. Scientifically known as Mesoplodon traversii, the species was named after Henry H. Travers, a New Zealand naturalist who collected a partial jawbone that was found on Pitt Island in 1872. Pitt Island is part of the Chatham Islands group situated about 800 miles downstream from the Bay of Plenty.A damaged skull was also found on White Island in the 1950s. This island is inside the Bay of Plenty, 30 miles north from where the two spade-toothed whales beached in 2010. In other words, this rarest of all whales must hang out somewhere not far from the Bay of Plenty. The big question is why did this mother and son beach. Where there any whale-dangerous earthquakes nearby? The answer is YES... there were 7 undersea quakes that might have cause this beaching. The problem is trying to sort out which one was the most likely. When a whale, or a pod of whales, is exposed to a series of excessive pressure changes, the volume of air in their sinuses expands and contracts on average 7-8 times per second, for up a minute or more. These changes in volume of the air inside whale's head damage the membranes surrounding the sinuses, air sacs, and middle-ear air chambers and allows air to leak into the surrounding tissues. The air is not only used to generate biosonar clicks but also used to isolate the two inner ears and to reflect and channel returning echoes in such a fashion to enable the workings of biosonar. Thus, a pressure related injury by an earthquake (sonar, airgun, or explosion) will instantly knock out their biosonar system. Many whales recovery after a week or two on the surface; a few don't. Toothed whales use biosonar to navigate; therefore, a whale suffering biosonar failure due to barotrauma caused by an earthquake encounter is as lost at sea as a blind man set adrift in a rowboat without a compass. Since water is 800 times denser than air, resistance to swimming upstream will turn any lost whales and point them downstream in the path of least drag. It's a simply matter of physics; everything in the ocean without a sense of direction, dead or alive, will always travel along with the flow of the surface currents. Thus, the job in picking the right event involves gathering data on the possible earthquakes, determining the distance from the epicenter to the beach for each quake, determining if the surface currents flow from the epicenter to the stranding beach, and then matching the timing of the stranding with the flow of the currents and the distances traveled. Each above 7 quakes might have been responsible. The one that best fits is the more potent event on 22 November mostly because this 5.8 mag quake was extremely shallow at 2 km below the surface. Since the focus is much closer to the rock/water interface, more seismic energy is delivered into water. As you can tell by the beach balls in the graphic above, the movement in the seafloor was vertical. View complete summary of the quake. As a note... the danger to any diving whales nearby would depend more on the SPEED of the vertical jerking and not on the magnitude of the quake because during thrusting earthquakes the rocky seabed acts like a giant piston, pushing and pulling and pumping at the water column, generating intense waves of alternating water pressure that move up from the seafloor at 1,500 meters per second. 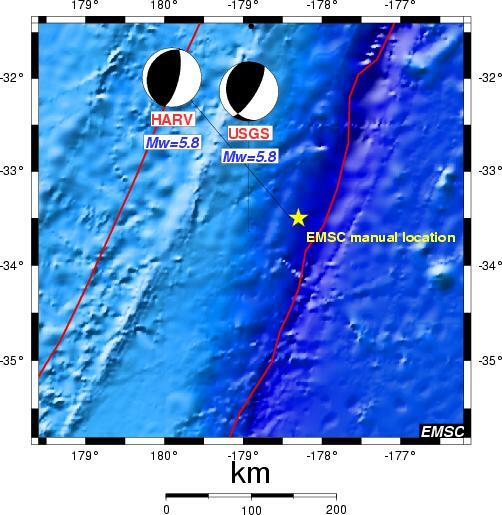 This series of powerful low-frequency seismoacoustic pressure waves are called seaquakes by mariners who have reported encounters with thousands of these extremely frightening events. For example, the oil tanker Ida Knudsen was declared a total loss after she encountered a shock wave from a nasty undersea earthquake. You might also like to read hundreds of other examples of ships knock about by undersea earthquakes between 1700 and 1899 and between 1900 and 2009. Remember that rapid and excessive changes in the surrounding water pressure is every diving mammals worse nightmare come true, especially whales returning to the surface after a deep dive, and supersaturated with nitrogen. 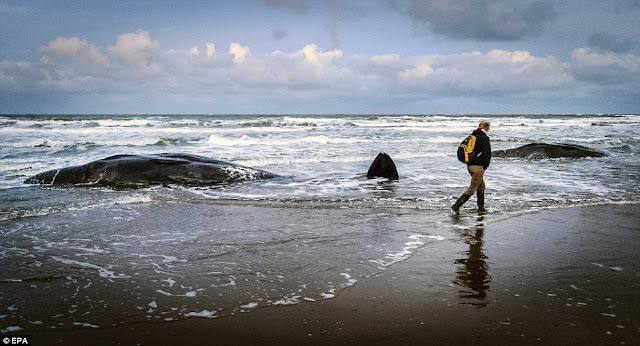 In fact, the Deafwhale Society has traced over 200 whale beachings over the last 30 years, each of these strandings occurred on average 26 days after, and 2,700 miles downstream, from a shallow undersea earthquake. The surface currents near the epicenter flow west as a counter current between two steams of current flowing east. The lower stream in the charts below is known as the East Auckland Current (EAC). The way it looks, the injured whales first swam west with the counter flow into the Tasman sea. The westward current slowed on 16 December (see second chart). The whales then turned south for a short while and were picked up by the EAC and carried back to the Bay of Plenty. A strong southern wind north of 25S shifted the EAC south and created a meander of the eastern flow that dipped into the Bay of Plenty and washed the spade-toothed whales into shallow water and they beached. I would not be surprised by the condition of the carcasses to learn that they actually beach 2-3 days sooner. Several permanent or nearly-permanent eddies (circular currents) have been identified around New Zealand, such as the North Cape and East Cape eddies and the Wairarapa Eddy. Permanent eddies tend to arise where the sea floor forces currents to make large changes in direction. These eddies make the job of picking the right quake to match the stranding difficult. Could the areanear this quake be a feeding grounds for the world's rarest beaked whales? A partial jawbone that was found on Pitt Island in 1872. Pitt Island is part of the Chatham Islands, about 800 miles down current from the Bay of Plenty. If the two whales had not beached in the Bay of Plenty, chances are good that they might have ended up in the Chatham Islands. A damaged skull was also found on White Island in the 1950s. This island, pictured below, is also inside the Bay of Plenty, 30 miles north from where the spade-toothed whales beached in 2010. Thus, we have a cluster of spade-toothed beached whales beaching themselves downstream from the high seismic activity found along the Kermadec Trench north of East Point. This would be a great place to start trying to photograph a live spade-toothed whale. This is spectacular information, thank you. I read the right column about the relationship with Beachings and Earthquakes. Do you know where I can get updates on whale/dolphin beaching's signaling possible upcoming earthquakes in the SF, CA area? Where would they beach themselves if this were to happen? Earthquake injured whales and dolphins lose the ability to navigate. Lost whales will always swim downstream.